Home / Case Results / Mt Vernon Sideswipe Accident Lawyer Review: Olivia P.
Mt Vernon Sideswipe Accident Lawyer Review: Olivia P.
On May 7, 2017, Olivia was driving northbound on South Fulton Avenue when another vehicle driving southbound on the same road collided into Olivia (sideswiping the driver’s side of Olivia’s car) at the intersection of South Fulton Avenue and East 4th Street. During the collision, Olivia recalled a deli grocery store on the right that she was trying not to crash into when the other vehicle collided on the left side of her car. Fortunately, she was able to avoid crashing into the building. After the accident, Olivia was taken by ambulance to Montefiore Mount Vernon Hospital. As a result of the accident, Olivia injured her neck, back, and right knee (which required surgery). Since she had a previous accident several years before, this car accident aggravated her past injuries. She knew that once the insurance company found out that she had past injuries from another accident, it would be difficult getting a fair settlement amount. To make matters worse, she also found out that the other driver lied and claimed that she was to blame for the accident. For years Olivia listened to Adam’s radio show. 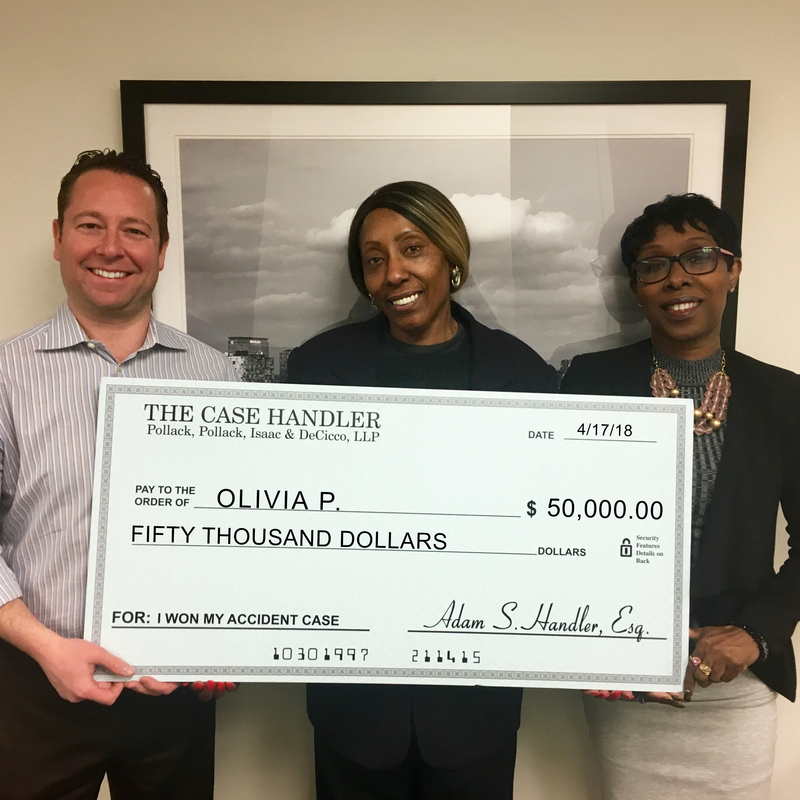 She chose The Case Handler team for her past accident and, after her second accident, she chose The Case Handler team again! With the help of our experienced Mt Vernon sideswipe accident lawyers at Pollack, Pollack, Isaac & DeCicco, LLP, we proved that the other driver was 100% at fault and recovered the maximum policy limit from his insurance company, State Farm. It doesn’t stop there! Since Olivia had UIM coverage on her own auto insurance, we maximized her recovery by doubling her settlement amount!